This section is devoted to answering the most common questions taxpayers have about how Jordan School District spends their property tax dollars. State and Federal laws are very specific about how these monies can be used. Along with the financial information on this page, additional answers to common financial questions can be found on the Did You Know? section of the website. This section will be added to and updated regularly. For more information on financial operations and transactions of Jordan School District, visit the Accounting, Budgets & Audits Department. New school construction is progressing on schedule and on budget. The following chart details the current status and budget of each project. 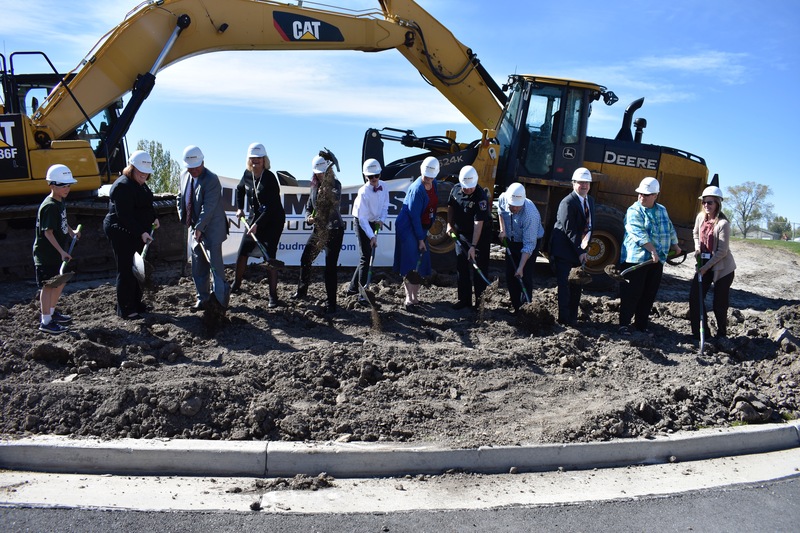 It is an exciting time as four new schools and the rebuild of West Jordan Middle get set to open in the 2019-20 school year. Now all four new schools have been named. Thank you to everyone who helped in the naming process by participating in an online survey suggesting names and then narrowing the field to choose from. The following are the names just approved by Board members with public input. After gathering input from parents, community members and elected officials, the Board approved Mountain Ridge as the name of the new high school in Herriman. Board member, Darrell Robinson, said the name seemed fitting because of the location of the school. In addition, the Board approved the Sentinels as the Mountain Ridge High School mascot. Colors for Mountain Ridge are scarlet red, gray and white. The color scheme will be seen throughout the school from the auditorium to the commons and cafeteria. In addition, all athletic team attire will be scarlet red, gray and white along with uniforms for band and choir. Outdoor facilities will proudly display the school colors as well. We put a hard hat on and headed inside the new West Jordan Middle School for the very first time. Watch as our tour guide, Director of Facility Services, Dave Rostrom shows us around! After a community survey with thousands of people participating, results are in on the official colors for Mountain Ridge High. Winning colors are scarlet red, gray and white. The color scheme will be seen throughout the school from the auditorium to the commons and cafeteria. In addition, all athletic team attire will be scarlet red, gray and white along with uniforms for band and choir. Outdoor facilities will proudly display the school colors as well. Stay tuned, after the new high school boundaries are established, people within the school boundary will be encouraged to weigh in on a school name and mascot. That survey is up next as excitement builds for the opening of the new high school in 2019-20! Watch This Cool West Jordan Middle Reconstruction Video! We have new drone footage showing progress being made on the New West Jordan Middle School. Construction on the new school is on schedule with crews busy working on dry wall, installing electrical and mechanical systems and installation of the building’s roof. The new school will open in the 2019-20 school year. This video was provided by Bud Mahas Construction. Construction continues to move forward for six new schools in the District. There are changes almost daily thanks to significant progress being made. The new schools were promised in the voter-approved 2016 bond. Here is our updated photo gallery of the new schools. 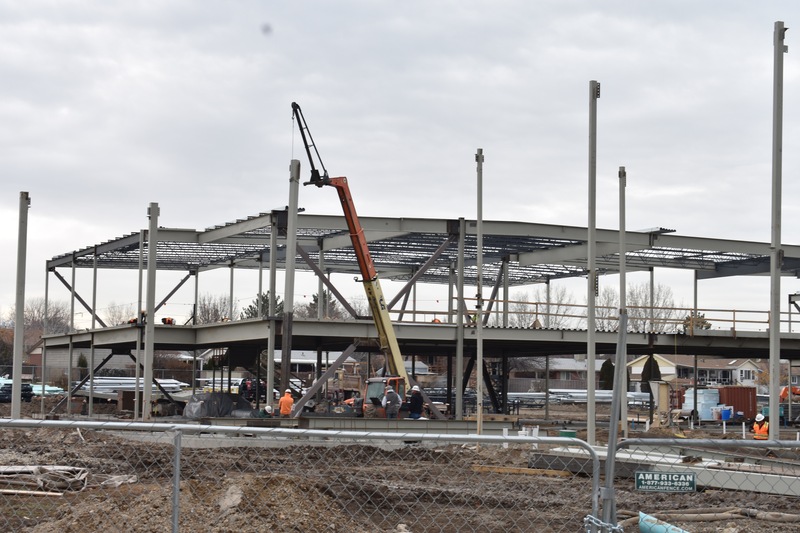 Construction is moving ahead and on schedule for three new schools in the District and there are changes almost daily thanks to significant progress being made. The new schools are part of six schools promised in the voter-approved 2016 bond. If you haven’t been by to see the rebuild of West Jordan Middle, the new high school in Herriman or the middle school in South Jordan – we invite you to take a visual tour. Here is our updated photo gallery of the new schools. Enjoy! In order to build the six new schools identified in the bond plan, the District must now begin the process of selling $245 million in voter approved bonds. This is a process that takes place over a number of years. The first bond sale was in February of 2017 for $38,850,000. We issued another $77,475,000 in February of 2018 for a total of $116,325,000 issued out of our $245 million authorized. The District will sell bonds as needed to maintain the construction schedule for the six new schools. Selling the bonds in increments over a number of years also saves taxpayers money. The interest rates and construction bids on the schools are meeting projections and are on target. Ground will soon be broken for three new schools in Jordan School District. They are part of the six schools promised in the voter-approved 2016 bond. A new middle school in Bluffdale will be 187,000 sq. ft. and similar to the West Jordan Middle rebuild design. This school will open in the 2020-21 school year. A new elementary school in Bluffdale will be 75,000 sq. ft. and the same design as Bastian and Golden Fields Elementary Schools. This school will open in the 2019-20 school year. A new elementary school in Herriman will be 75,000 sq. ft. and the same design as Bastian and Golden Fields Elementary Schools. This school will open in the 2019-20 school year. Construction continues on three other schools with work ahead of schedule and under budget. A new high school in Herriman, a new middle school in South Jordan and a rebuild of West Jordan Middle School. All three of these schools will open in the 2019-20 school year. Two schools are opening a year earlier than projected at the time of the bond election – the new high school in Herriman and the new middle school in Bluffdale. Collectively, bond projects are coming in under budget and all money saved will be used to purchase land for future new school construction in other areas of the District. All three schools are scheduled to open in the 2019-20 school year. Enjoy a photo gallery of the progress at each school. New School Buildings Starting to Take Shape! All three schools are scheduled to open in the 2019-20 school year. See the progress for yourself in a photo gallery on our Facebook page! 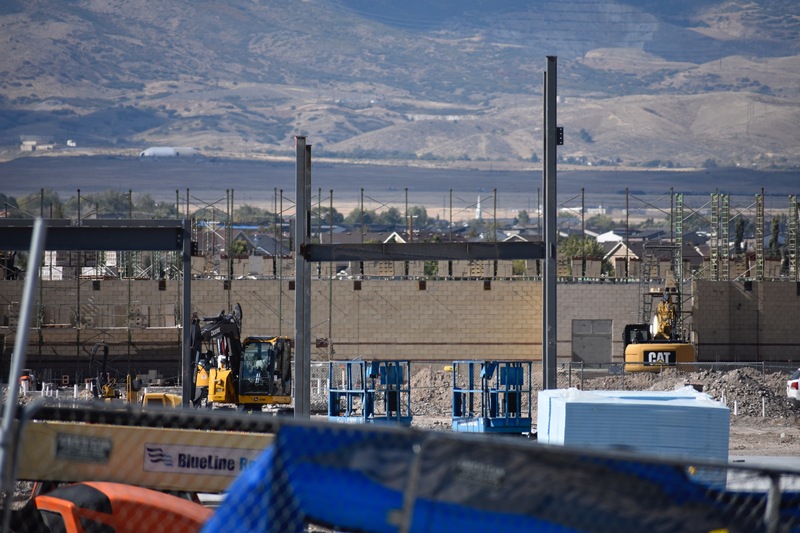 If you have driven by the site of the new high school in Herriman, you can clearly see it is full speed ahead for construction crews who are making progress every day. While they work on footings and the foundation, underground plumbing, drainage and electrical lines are also going in for the high school. The new school is located at 14100 S. 4800 West and will open in the 2019-20 school year. Excavation work has now begun at the site of the new middle school in South Jordan. The school, located at 10200 South 5200 West, is scheduled to open in the 2019-20 school year. Excavation work is also underway at the site of the new middle school in West Jordan. The work is taking place on the field behind the old school and right now crews are getting ready to pour footings for the new building. This school will open in the 2019-20 school year. Ground work and excavation continues to move forward at the site of the new high school in Herriman, located at 14100 South 4800 W. Crews are ready to pour footings for the new school which is scheduled to open in the 2019-20 school year. The current West Jordan Middle School was built in 1958 and now its time to pave the way for a new school and continue the legacy of quality education and community pride that comes with it. The new school is being constructed thanks to taxpayer support of a successful 2016 Jordan School District bond. The new school will be built on site, located on the field behind West Jordan Middle and is scheduled to open in the 2019-20 school year. Monday afternoon, school District officials, local city leaders, police, fire and community members gathered to celebrate the rich history of West Jordan Middle. They came together with shovels and hard hats to break ground for the future school. Isaac Atwood, 9th Grade Student Body President, told the crowd that while parts of the old school will be missed, it is students that make West Jordan Middle the amazing school it is and that tradition will continue with the new building. The earth moving equipment has arrived and crews are already paving the way for new schools to be built thanks to passage of the 2016 Jordan School District bond. At the location for a new high school in Herriman just north of Rosecrest Drive and east of the Mountain View Corridor (approximately 14100 S. 4800 West) site grading is now underway to clear the property for construction. 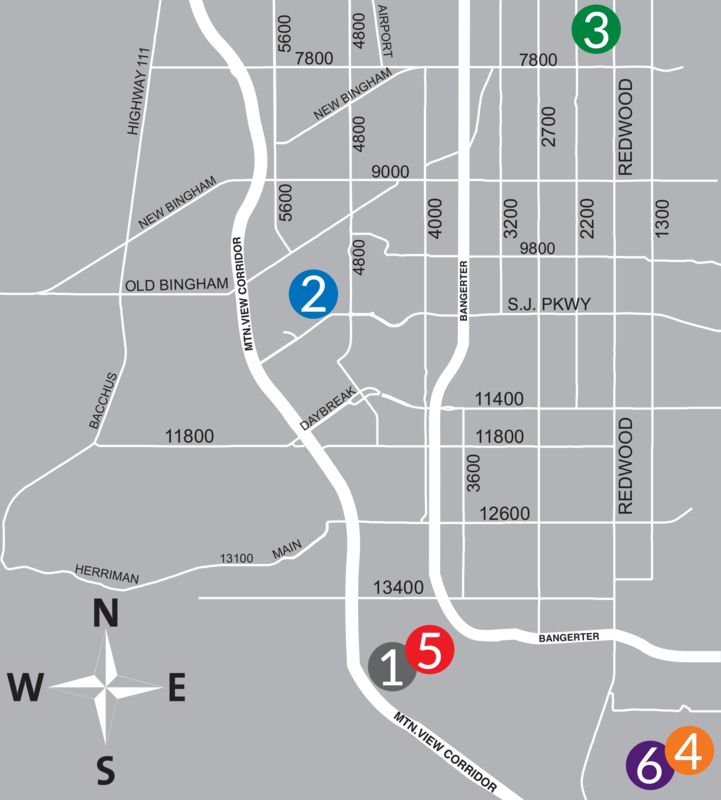 Similar work at the site of a new middle school in South Jordan (10200 S. 5200 West) will begin at the end of March. Here are site plans and conceptual drawings for both new schools, which are subject to minor modifications. Thanks to a successful $245 million bond, six new schools will be built to accommodate growth.